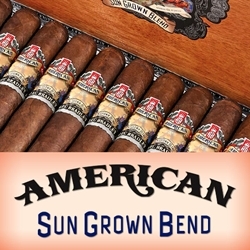 A similar blend to the popular Alec Bradley American Classic, the Alec Bradley American Sun Grown is a Nicaraguan puro hand crafted individually by highly skilled cigar rollers. Each of these and-rolled premium cigars are infused with complex blends of Nicaraguan long-fillers and a Nicaraguan binders. The wrapper that holds together all of these amazing tobaccos is a Nicaraguan Habano, sun-grown from the Jalapa region. Alec Bradley American Sun Grown premium cigars are medium to full in body producing a hearty flavor touched with complex spices that are perfectly-balanced, giving way to a smooth sweetness with every draw. Smokers Discounts offers the perfect way to unwind with Alec Bradley American Sun Grown premium cigars. Every cigar purchased on our online cigar store can be delivered right to your front doorstep. We’ve made it easy and affordable to buy hand-rolled cigars. A variety of sizes and flavors are listed below, each of these styles are in stock and available for a low discount price! Call us for more details!